You've heard it said, "it takes the right tool for the right job". We have the tools plus the training and tact to use those tools. We can handle everything from the smallest office to the largest warehouse- and anything in between. Our professionally trained staff and superior equipment allows us to offer the highest quality floor maintenance, upholstery and window cleaning available. We also do thorough construction cleanup and building maintenance for new buildings, which can save you time and added expense. Our cleaning equipment, products and cleaning techniques are constantly being upgraded to meet the growing demands of our customers. 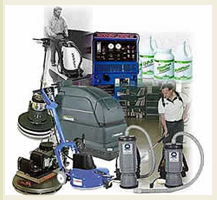 Our equipment consists and assortment of commercial vacuums, carpet cleaners, high-temperature extractors, floor buffers, burnishers, hard floor cleaners, power washers and related accessories. We not only clean carpeted, tile and hard floors but any upholstery or fabric surfaces as well. We can professionally clean the inside or outside of office windows and offer a complete line of cleaning products for use in our building cleaning maintenance programs. We combine the power of a truck mounted Prochem hot water extraction machine with Rotovac and Hydramaster powerheads. These tools are industry leaders and at the forefront of R & D. The application of these tools makes for the most effective and thorough cleaning that is available. 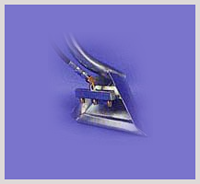 The equipment is capable of cleaning carpet from all directions, down to the carpet backing. The Rotovac and the Hydramaster RX-20 are more affective than cleaning with the Wand with the exception of inside small spaces where the equipment won't fit. The scrub wand is good for extraction and in tight corners but the forward and backward cleaning action depends on manual labor, operator strength and endurance. Because of this we use the Wand only for very tight areas where other devices won't reach. 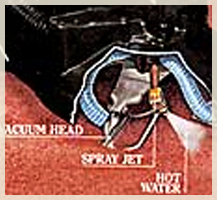 A rotary scrubber has good agitation, but lack of extraction can over wet and damage carpet. We recommend the Rotovac or HydraMaster's RX-20 which have the best agitation and extraction available. Both the Rotovac and the RX-20 are good workhorse machines that do quality cleaning. Both machines are able to save you time and money on your cleaning budget. 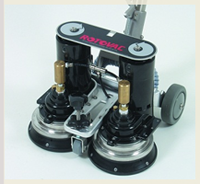 The self-powered, counter-rotating cleaning heads of the Rotovac thoroughly cleans carpet from all directions. With the Rotovac, the physical demand of extraction cleaning is reduced to an easy one hand operation. This is a powerful combination of maximum heat, agitation and rotary flushing which allows Rotovac to restore heavily soiled carpets and matted traffic areas with ease. The self-powered RX-20 consistently cleans all areas of the carpet, as operator's physical strength is not important. It applies the power of 5 men simultaneously cleaning, returning carpet fibers to a like-new fluffy condition. For extraction we use either Prochem's Performer 405 and Legend SE which are the best extractors on the market. 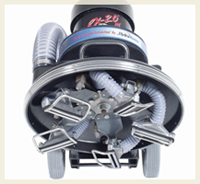 This extraction device is the heart that delivers the power needed to thoroughly clean carpet. These truck mounted devices are capable of delivering pressurized cleaning solution up to 250 degrees farenheight. 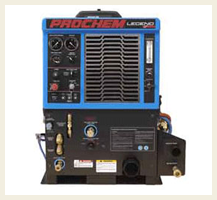 This unit can also be used with a pressure washer and for quickly emptying flooded basements. We have a vast assortment of equipment too numerous to list. This equipment is capable of cleaning ceramic tile, waxed/non-waxed and many other hard surface floors. The type of equipment we use is dependent on your particular needs. 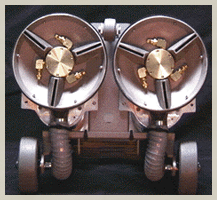 Our high speed burnishers are great for hallways, small areas, tile and other hard floors. Our high speed propane powered buffers are better for large areas. Automatic Floor scrubbers are used where several cleaning procedures and finishes are needed in one multifunction-machine. Hand surface cleaners and small lightweight scrubbers are useful in detail work, cleaning on top of steps and for some window or wall cleaning. If you have a surface to clean, we probably have a tool that will effectively and efficiently do the job. Below is a short example of just some of the equipmentwe use for hard floor cleaning. We use the Drimaster upholstery cleaning system and other technology to thoroughly clean sensitive or coarse fabrics on your furniture surfaces. 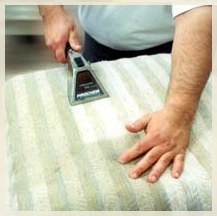 We are capable of gently cleaning delicate or antique furniture fabrics without discoloration or damage whatsoever. We use the best cleaners which will not only remove months of dirt but will keep your windows looking crystal clear for a longer period of time. We clean the inside AND THE OUTSIDE of the window when required. 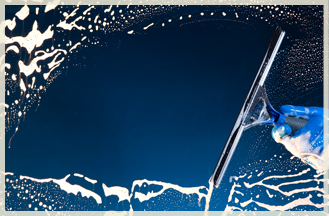 Our window cleaning experts will safely clean any debris and give a like-new appearance to those grimy windows. We have standardized products that are capable of removing stains, discoloration and bring back a like-new appearance to all the surfaces we clean. We also carry a line of cleaning agents that are environmentally friendly. 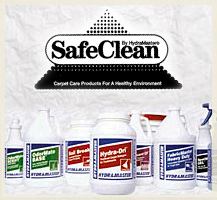 SafeClean detergents and deodorizers are formulated without certain components found in typical carpet cleaning formulas. SafeClean Products are tough on carpet soil yet gentle on carpets. It doesn't have to cost more to use a safe product. Regardless of which of our services you use, you'll have the satisfaction of seeing and knowing that the job was done the right way… The Spotless Cleaning Way. We'll work with or after your crew in removing scrap construction materials, saw dust or any other debris on the job site. This will help your contractors or subcontractors to do their job more effectively and most of all more safely. Using this service will also allow for quicker occupancy of the homeowner or business. Our services can include washing windows, sealing or waxing new floors, removing factory packaging, basic cleanup or any other service required. With the proper tools, training and tact you can trust us with all your cleaning needs. If you would like additional information on our cleaning equipment, products and anything else please contact us.